(CNN) -- South Korean outsider YE Yang maintained a one-stroke lead at the Honda Classic after a solid third round of 70 in Florida left him clear of U.S. duo Jeff Klauk and Jeff Overton. 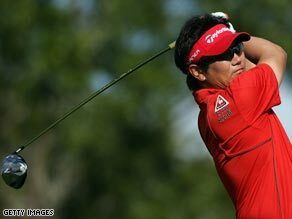 Korean outsider Yang maintained a one-stroke lead at the Honda Classic after a solid third round of 70. Yang bogeyed the third at PGA National in Palm Beach Gardens but hit his tee shot to within six feet at 15 for a birdie and remain seven under par. Overton also posted a 70, largely due to a triple-bogey seven at the 11th, while Klauk's 67 contained four birdies against one dropped shot. Yang's compatriot Charlie Wie fired an impressive 65 to climb to five-under alongside Brett Quigley and John Rollins, who shot 67 and 68 respectively. Mark Calcavecchia also produced a five-under 65 to join five other players within three of the leader. World number 460 Yang was satisfied with his effort as he chases a first PGA Tour victory, saying: "It's very hard to get birdies out here, it's probably easier to get bogeys." He added: "I shot even par today and I'm happy with that. First day I wasn't putting well and my irons weren't great but I felt a lot more comfortable, I was putting better and saving pars." Overton felt he relaxed after his triple-bogey at the 11th, which helped him to claw his way back into contention. "It was interesting. I felt like I played one really bad shot, I was right between clubs. I should've hit a nine iron instead of a pitching wedge," he said. "I tweaked my putting stroke a little bit and I got a lot of confidence towards the end of the round and it carried over to ball striking. "I felt a little bit tight at the beginning of the round because I was right there in the thick of things but I hung in there and after that triple I loosened up and dug deep." Veteran Calcavecchia, meanwhile, is bidding for his third Honda Classic having previously won the tournament in 1987 and 1998. "I played great today, I hit a few loose shots in the middle of the round but after that I settled down. Those last four holes are scary, it's a tough finish but I'm happy with the round," said the 48-year-old.